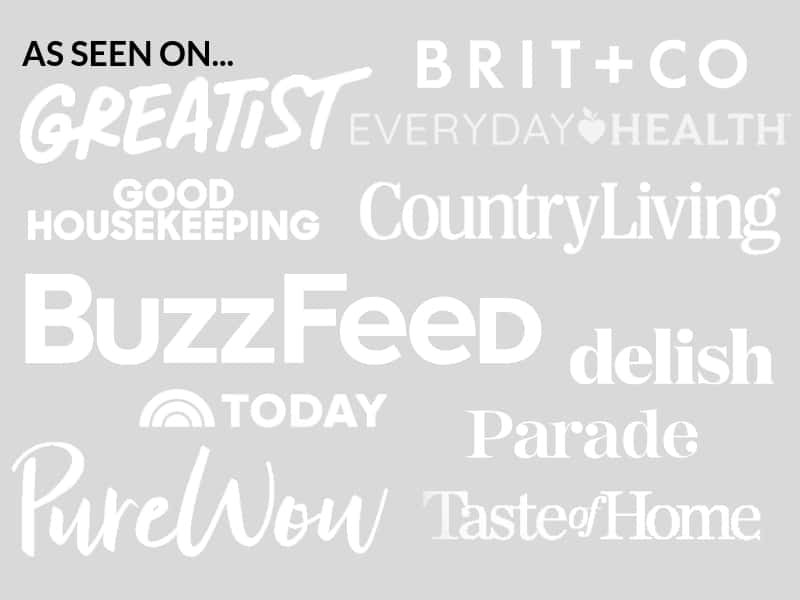 November 15, 2018 By Elizabeth Lindemann Leave a Comment / This post may contain affiliate links. 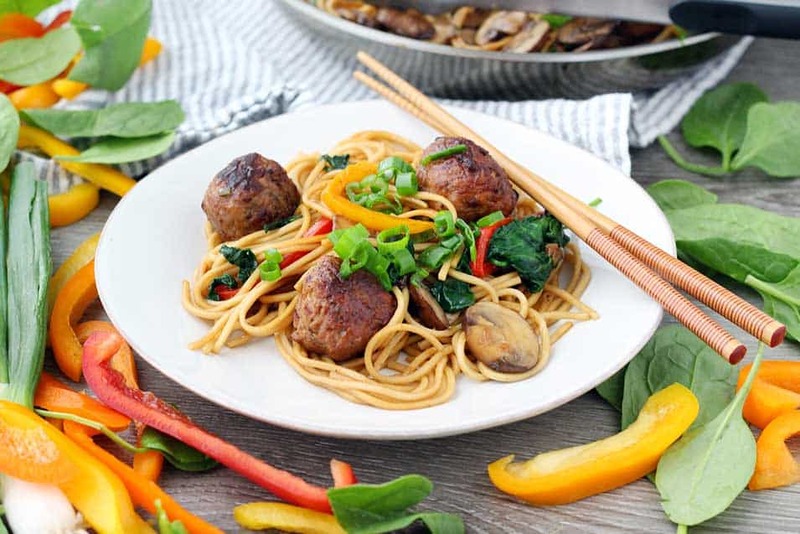 This 20-Minute Lo Mein with Chicken Teriyaki Meatballs should be your new go-to for a family friendly, veggie-packed meal on busy weeknights. It’s a cinch to throw together and the flavor combination is so delicious! Around the holidays, I always crave global cuisine. There’s usually so much focus on traditional “American” food – meats and potatoes, comfort food, turkey/ham/roasts… in between the holidays, I tend to want to switch it up a bit. 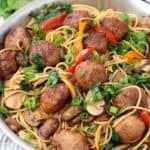 This lo mein recipe is a wonderful way to keep dinner special during the holiday season, since it’s so colorful and flavorful. And it’s also a great way to get a healthy dose of veggies, which can be hard to do around the holidays! 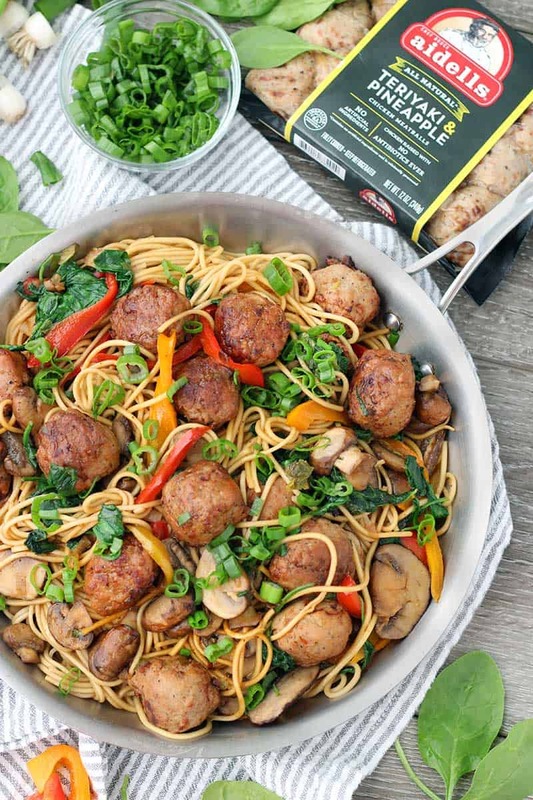 Mushrooms, bell peppers, green onions, and spinach are all packed into this recipe, along with lo mein noodles and the most DELICIOUS Aidells® Teriyaki & Pineapple Chicken Meatballs… which are already cooked and prepared! They help make the recipe so flavorful and easy. I picked up a package of Aidells Teriyaki & Pineapple Chicken Meatballs in the refrigerated aisle of my local H-E-B and knew immediately that they would be perfect in a lo mein recipe. I was impressed with the delicious flavor combination in the meatballs. They hit all the major tastes- sweet and savory, with a burst of umami and that slightly spicy flavor of ginger. For an unassuming meatball, they were packed with unexpected flavor. And they’re made with quality meats and ingredients, so I felt great about serving this to my family. And by the way, my toddler LOVED it. All of it. The meatballs, the noodles… everything. This is a very kid-friendly meal. For all my H-E-B shopping folks, coupon alert! You’ll be able to pick up a package of Aidells Teriyaki & Pineapple Chicken Meatballs with a yellow coupon offer for $1 off from 12/19/18 – 01/01/19. If you follow my blog, you know I love cooking from scratch. But it’s so nice to have some go-to prepared ingredients for easy recipe hacks. Making meatballs from scratch would add another 30-45 minutes to the prep time for this meal, so I was happy to have a flavor-packed protein prepared and ready to go. I also love using flavor-packed ingredients like Jimmy Dean® Refrigerated Roll Sausage for easy prep around busy times like the holidays. Brown the sausage and add it to breakfast casseroles or breakfast tacos, or use it in a cozy soup! You won’t have to spend as much time measuring out different spices and ingredients since prepared sausage is already packed with flavor. 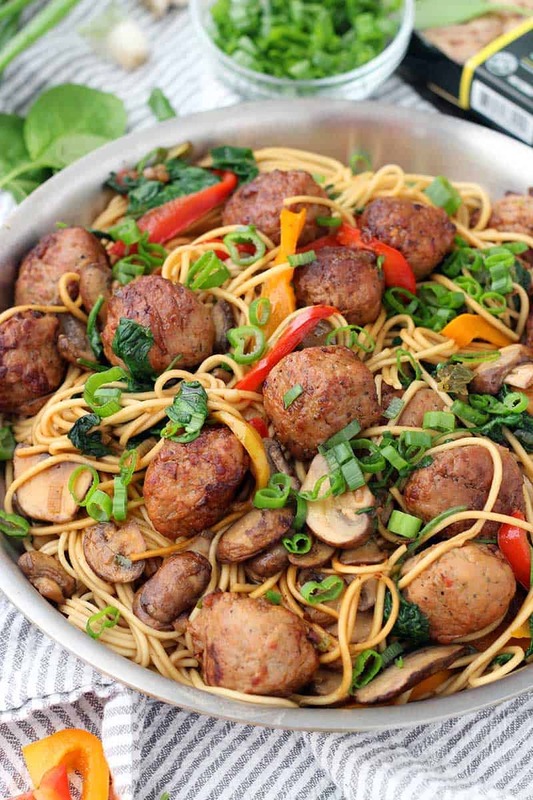 This Lo Mein with Chicken Teriyaki Meatballs is perfect to serve family style. Just place it in a bowl or serve it directly from the skillet in the center of the table for everyone to help themselves. To me, having one dish that can serve everyone feels like the ultimate recipe hack. Especially during the holiday season when everyone is busy and we have friends and family over from time to time. It’s also a great way to get your kids to start practicing using chopsticks! This recipe is very flexible. You can use really any kind of vegetables you want. I liked the sweetness of the bell peppers and the earthiness of the mushrooms paired with the flavors in the meatballs. And I’m always looking for more ways to eat leafy greens, so the spinach was perfect. Broccoli, snap peas, matchstick cut carrots, celery, green beans, zucchini, etc. would all be delicious in this. And if you can’t find lo mein noodles at your grocery store (I found mine in the aisle with the other Asian ingredients, like soy sauce and Sriracha), you can use regular spaghetti noodles or fettuccini in a pinch. All you need to do is brown the meatballs in a little canola oil (or any other neutral tasting oil) in a large, deep skillet or wok. They’re already cooked, so you just need to heat them through and get a little color going on the outside. Then, remove the meatballs and cook the veggies. Add the cooked noodles, sauce (a simple mixture of soy sauce, sesame oil, honey, and Sriracha if you’re feeling spicy), and the meatballs back into the skillet and toss to combine. Easy peasy! If you like this 20-Minute Lo Mein with Chicken Teriyaki Meatballs recipe, you’ll love this Skinny Pineapple Chicken with Cashews, this 10-Minute Veggie Fried Rice, and these Chicken Banh Mi Tacos. 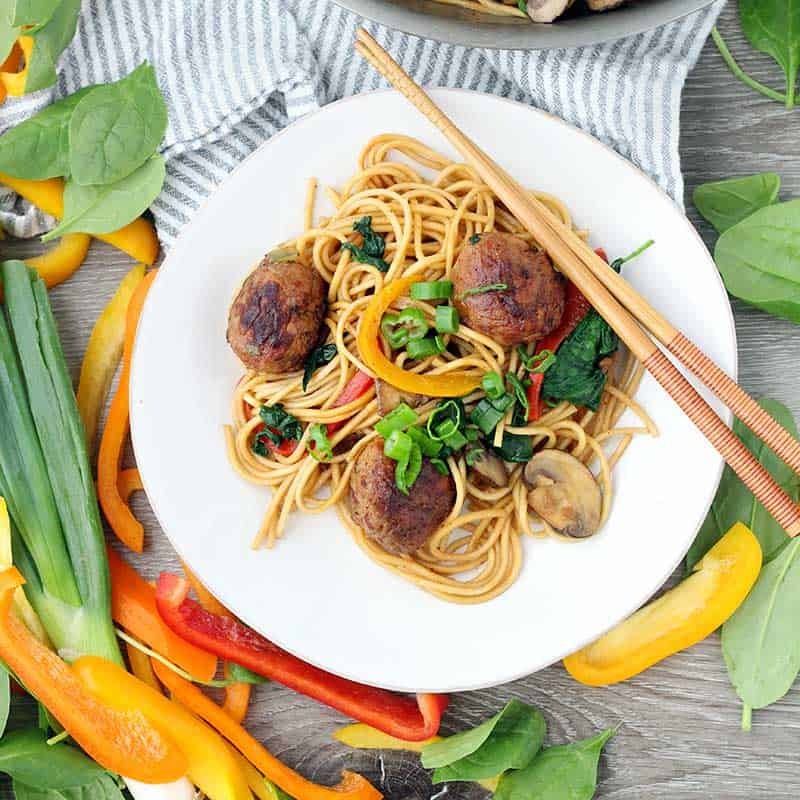 This veggie-packed Lo Mein with Chicken Teriyaki Meatballs recipe comes together in only 20 minutes! It's the perfect kid-friendly meal for busy weeknights. Cook lo mein noodles in boiling water according to directions on package and drain well. In a large skillet or wok, cook the Aidells Teriyaki and Pineapple Chicken Meatballs in 1 tablespoon canola oil over medium high heat, turning occasionally, until heated through and browned on all sides (6-8 minutes). Remove from skillet and place on a plate. Add remaining 1 tablespoon of canola oil to skillet. Sauté the white parts of the green onions, mushrooms, and bell pepper over medium-high heat until softened and beginning to brown (about 5 minutes). Add the baby spinach and stir until wilted (about 2 minutes). Meanwhile, to make the sauce, whisk together the soy sauce, honey, sesame oil, and Sriracha in a small bowl until well combined (or shake together in a jar). 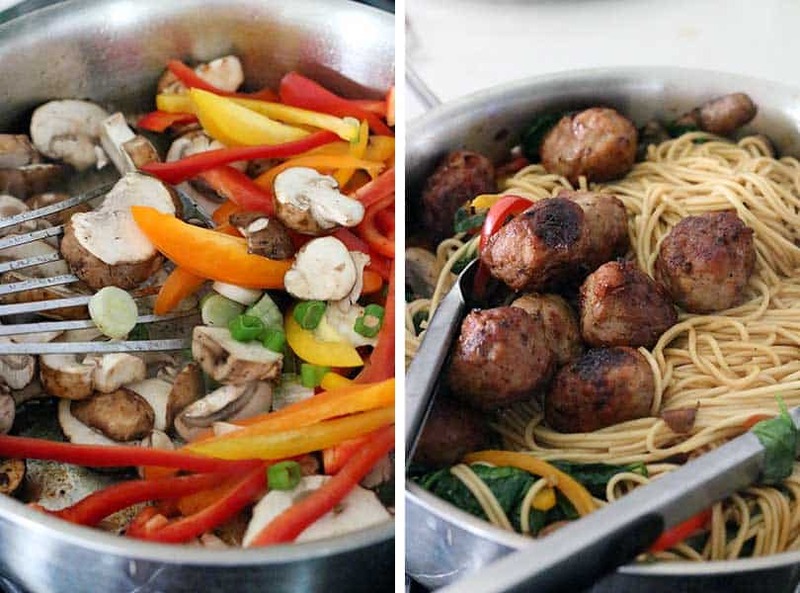 Add the meatballs, cooked noodles, and sauce to the skillet and gently toss to combine. Serve immediately, garnished with green parts of the scallions. To save time, prep your veggies while the meatballs heat up.